My first interview was with a representative of Slow Food Columbia. I asked about barriers to eating locally and she told me about a potluck Slow Food recently sponsored which asked members to bring a dish featuring local ingredients that did not exceed $5 per serving. This potluck was presented as a way to show how eating locally is actually affordable. The average daily SNAP allotment is $4 per person. Although this event and a number of the events Slow Food sponsors are geared toward more privileged members of the community, I was surprised by the disconnect between this view of affordability and the international organization’s statement of Good, Clean & Fair, where fair means food is “accessible to all, regardless of income...” This local chapter does have events on the horizon to engage lower income community members and they do a lot of good for the local food movement in Columbia but how far ahead should we push the movement without engaging an entire portion of our community? How can we assure the inequities of our current food system will not bleed into alternative food systems without first paying attention to fairness for all eaters? The leading rhetoric, pushed by the popular leaders of the movement, is that eating locally can be easy. By doing a little more work, and sometimes spending a little more money, change will happen. They fail to acknowledge that 50 million Americans have trouble putting enough food on their tables of a healthy enough quality to nourish their families, without even bringing into question how far that food traveled. After my first interview, I decided to focus on how assets and access affect the food choices low-income households are able (or not able) to make (Gregson). I largely ignored the role of education in increasing food security because it often distracts from the structural inequalities that are perpetuated in the local food movement. When asking customers to pay more for their food, those unable or unwilling to pay more are viewed as not valuing the benefits of eating locally (Guthman). By focusing on the structural inequalities already present, I hope to encourage investigation of potential alternatives to increasing low-income eaters’ food purchasing power and access to healthy, sustainable foods. Although food insecurity can be answered locally, treating the environment and the farmers with more respect than the conventional food system, it is not the only scale of action necessary to create real and lasting change for every eater (Purcell, Libman). 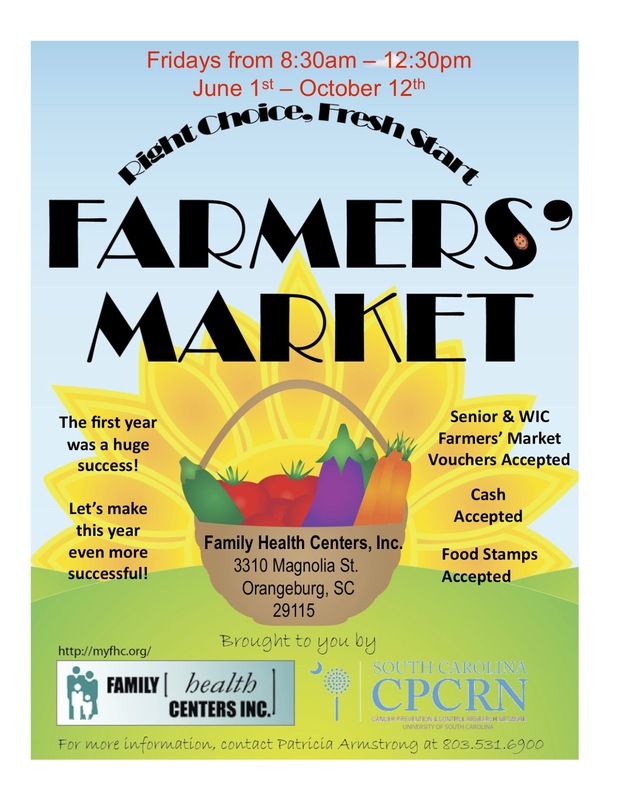 One program I highlight in the exhibit that addresses food insecurity on a local level well is the Right Choice, Fresh Start Market in Orangeburg, SC. 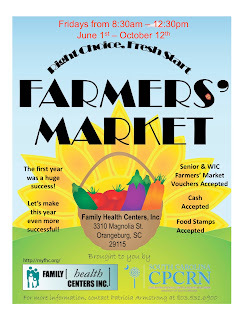 The Right Choice, Fresh Start farmers market opens every summer at the Family Health Center in Orangeburg. The market is a partnership between the health center, the College of Social Work, and the Cancer Prevention and Control Research Network at USC. The community that uses and lives around the health center chose the market’s name, its operating hours, and a market manager. For the first $5 of food assistance market customer spend, the market doubles the amount of produce those customers receive. The Right Choice, Fresh Start market provides a useful model in considering food insecure households when discussing the local food movement. The market, while built for the disenfranchised, benefits every participant. Higher income customers in the area don’t have to drive farther away to another market. Farmers are able to sell their produce for a profit. The state economy captures a greater percentage of the food assistance money than it would otherwise. At the national level, the local food movement needs to advocate for fully funded food assistance programs to increase the food purchasing power of local income households. If we demand that eaters pay the full price for their food, accounting for all of the negative externalities our current food system creates, shouldn’t we ensure that low-income households have the ability to do so? Produce prices that reflect their true cost, while benefiting the farmer and the environment, do so to the detriment of food insecure eaters. Without adjusted food assistance programs, the diet quality and consequently the health of these eaters would suffer (Berg). The spaces we create or maintain as public historians, especially when talking about the local food movement, need to take into account all socioeconomic levels. My part in the local food movement as a public historian is to widen the conversation to include every eater, to fulfill the promise of Slow Food in creating a fair food system. Nationally, this means fully funded food and nutrition programs and locally this means building points of access to healthy, sustainable food for low-income eaters. The popular arguments of the local food movement, the leading rhetoric of ease, needs to be revised. It needs to acknowledge the necessity of attending to others tables as well as one’s own. Certainly we have a stake in regaining lost knowledge, teaching how to garden, teaching how to cook, but this educational component needs to be paired with an analysis of the structural inequalities that hamper food choices. Food purchasing power and food access are key issues along with this question of education. Public historians can play a role in facilitating the conversation around the local food movement by including low-income eaters. The model of community engagement supplied by the Right Choice, Fresh Start market can be more often revisited when we create content, especially when that content involves food. 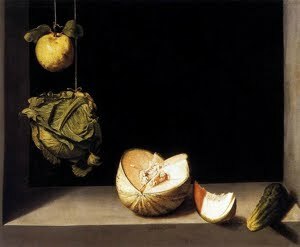 Food is central and essential. As eaters, we are all experts. Berg, Joel. All You Can Eat: How Hungry is America? New York: Seven Stories Press, 2011. Gregson, Jennifer. How Inequality Influences Individuals through the Built Food Environment. Diss. University of California, 2009. Ann Arbor, MI: UMI, 2010. Guthman, Julie. ""If They Only Knew": Color Blindness and Universalism in California Alternative Food Institutions." Taking Food Public. Psyche Williams-Forson and Carole Counihan. New York: Routledge, 2012. 211-222. Libman, Kimberly. Eating the City: Food Environments, Inequality, and the Everyday Journeys of Eaters in New York and London. Diss. The City University of New York, 2012. New York: UMI, 2012. Purcell, Mark. "Urban Democracy and the Local Trap." Urban Studies. 43.11 (2006): 1921-1941. This is such a thought-provoking post, Tyler - it's got me thinking in a bunch of different directions! Certainly these issues of class in the locavore world are vexing (and frequently discussed). I particularly like your discussion here of the importance of working on the policy and community-organizing fronts at the same time. One of the big sticking-points in making these kinds of changes in the U.S. is that so many people don't buy into the collectivist mindset that sees everyone as interconnected and to some extent mutually responsible for each other. I think that mindset definitely kicks in at the local level around food issues - I'm always amazed each year in my fairly non-wealthy area when our local "food-a-thon" fundraiser pulls in tons of donated food and a good deal of cash as well. It seems that people do rally around each other when they realize that others in their community are poorly-nourished. But that doesn't necessarily translate into broader policies, and a lot of the same people who are generous in giving individually would likely grouse about their tax dollars going to support the same thing on a more systemic level. So should we be trying to link those two levels, and perhaps look for ways to present the policy solutions as just a larger version of the generous impulses that often operate on a more local scale? I have presented the exhibit twice so far and that tension between generous impulses and larger systematic solutions has come up multiple times when discussing the content with my audience. I have take-away postcards with individual action items and many are willing to take cards about donating to or volunteering at Harvest Hope but are resistant to the idea of talking to policy makers about systematic solutions. Connecting these levels of action as well as connecting food assistance participants with the majority of my exhibit audience (who have largely been food secure individuals) and policy makers would be the next step. For example, Governor Haley is trying to push through a SNAP waiver that would limit the foods SNAP participants would be able to buy. At the public hearing I attended, one SNAP participant asked why Haley, DSS, and DHEC did not ask for SNAP participants' opinions before moving forward with the waiver. Although the discussion was structured around what should and shouldn't be on the SNAP-allowed food list, the majority of those who spoke were wholly opposed to the idea of the waiver. Engaging food assistance program participants, program administrators, and policy makers should have been the first step: a local, face-to-face discussion to begin larger, systematic change. Thanks for raising these issues. After years of volunteering on an urban farm, my husband has become involved in starting a community garden program, with the idea that the economics of local farming will not produce a product that is broadly accessible to residents and that personal gardening offers another way to access good quality food. The next challenge, however, is environmental--making sure that the urban soil is free of lead and other heavy metals. So many thoughts to consider! Thanks for a nitty-gritty policy analysis, which many of us are slow to consider (as you note). I think you and I are asking the same question about class: How can "organic," "natural," and "local" not be code words for "upper middle-class do-gooder"? Revising the "rhetoric of ease" is another thought I'll be rolling around for a while. A couple of years ago I met a person at a conference who was advocating that people use food stamps to purchase seeds. Since then, I've thought about this idea a lot. It seems a totally impractical way to address food insecurity; at the same time, it is an intriguing solution to the problem of consumption: make lower-income people food producers. Will, we have programs in NH that do that. It helps to complicate the image of "the poor" - a large percentage (can't look it up just now) of America's poor are rural, though our image is that of urban poverty. And a growing chunk of lower-income people are living in outer-ring suburbs as middle- and upper-income people rediscover the benefits of city living (and gentrification serves their needs). So, in NH and Northeastern MA for instance, many people who use food assistance programs actually do have the space for a garden. MAny come from gardening/farming traditions in their own families as well. So the the ability to use food stamps to generate many times the amount of food per penny makes sense for them. Of course, it doesn't make sense for everyone. First, there has to be enough surplus in the household economy to allow the purchase of a potential, not an immediate, food source. Second, not everyone is in the position of having space for a garden. Third, if you don't have a gardening past, it is a learned skill. Fourth, seeds aren't enough to create a garden by themselves, and other inputs may be required. So for me, this highlights the need for flexible, targeted, and localized solutions. It doesn't hurt urban users of food assistance to have seeds on offer, but it makes a big difference for rural people. I wanted to touch on the Slow Food $5 campaign issue, as well. While Tyler's criticism of the implicit messages is important and central to our work, it's also interesting to note that the $5 challenge was also attacked from within the movement, by people who felt that its message devalued farm labor and endorsed the "Big Ag" message that the primary value we engineer into food systems should be lowest possible cost. Again, it's a question of food systems work. Many farmers I know (some of whom qualify for food assistance!) objected to the idea that people should be looking to bargain down the price of their food, which is already either fair or near-inadequate for many of them. This does return us all to systemic issues. For me, it also points to a set of skills we need to nurture in public history practitioners and their allies in the food movement.